Hannah Orenstein’s Playing With Matches is a fun romantic comedy following the dating mishaps Sasha Goldberg has while she tries to create the perfect dating experiences as a matchmaker for her clients. It’s a completely perfect summer read. I started following Hannah on Instagram last year when Touchstone first announced her book, and it’s been such a fun experience watching her book go from the earliest bound galleys to the finished product. I read this book in a handful of sittings, and it was such a joy to read. 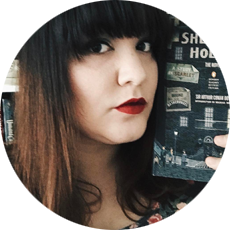 Hannah’s writing style and voice is fresh and fun, and she plays with a lot of romantic comedy tropes that left me turning the pages. Sasha Goldberg’s voice is both appropriate to her young age and also wise beyond her years, and the character felt real and so well-developed. I felt for her and wanted her to succeed, and I couldn’t wait to see what happened next. The other characters in Playing With Matches added such a dynamic to the story. Sasha as a matchmaker who had dating issues of her own made me laugh out loud several times throughout reading the book, and the twists and turns throughout her own dating adventures were entertaining and surprising. I didn’t expect a few of them! It felt like I was reading one of the classic Nora Ephron romantic comedies. I really hope someday to see more feel-good, hopeful, fun romantic comedies with this same feel on the screen soon, and I desperately hope Playing With Matches makes it to the big screen someday because I think it would be so much fun. 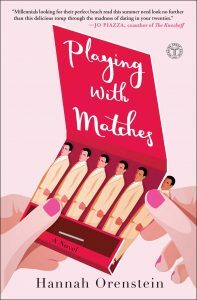 If you’re in the mood for some fresh romantic comedy to read this summer, go out and get yourself a copy of Playing With Matches! Thank you to Touchstone for sending me a free copy of the book for review!